While the report also looks at how the recent dip in interest rates may impact the demand for refinancing, the main theme of the November 2018 Mortgage Monitor is the shifting origination market. Black Knight's report notes that the first three quarters of 2018 produced the most purchase-dominated market in 18 years. Of the 4.8 million mortgages originated, about 63 percent were purchase originations, the largest percentage since 2000 when purchase originations accounted for about three-quarters of the total, and the rising trend is expected to continue. 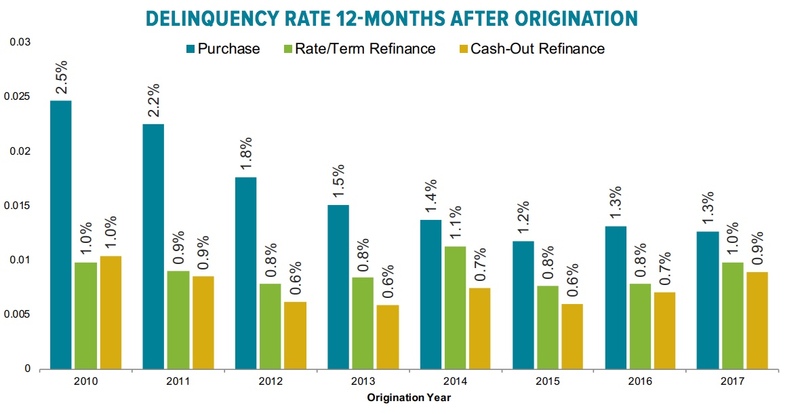 Even as refinancing has declined, the share of those loans has also been shifting. Steadily moving from rate/term driven demand to cash-out. Only 8.6 percent of all originations in the first nine months of last year were the former, the lowest share since at least 2005 when Black Knight first tracked it, while 27 percent were cash-out, the highest share since 2008. Ben Graboske, executive vice president of Black Knight's Data & Analytics division said, "In the most purchase-dominant market we've seen this century, we need to ask whether the shift in originations will have any impact on mortgage performance. The short answer, based on historical trends, is that it certainly bears close watching." 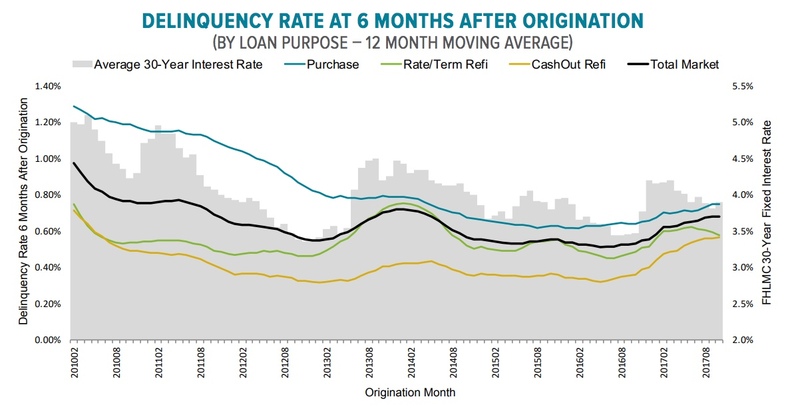 Refinances, whether rate/term or cash-out, have performed better than purchase mortgages in recent years. This is, in large part, because of a larger share of FHA loans has been used for purchasing. FHA generally has higher delinquency rates. So, what might happen to mortgage performance with the new purchase-loan dominance? Black Knight applies the 2018 year-to-date market blend to prior vintages and found the non-current mortgage rate would have grown by anywhere from 2.0 percent (in 2017) to 30 percent in 2012, a period when refinances made up more than 70 percent of all lending. The only exception was the 2014 simulation. That year had a strong cash-out refi performance and purchases were elevated because interest rates had spiked. Changing the purchase/refi balance had essentially no effect. Borrowers with high credit scores tend to be more proactive in refinancing when rates move lower but also tend to back off more quickly when rates rise. This means rising rates usually result in declining scores. This was demonstrated in the 2013/2014 "taper tantrum" when a 1 percent rise in mortgage rates was accompanied by a 15-point decline in credit scores among rate/term refinancers and a 11-point drop among cash-outs. 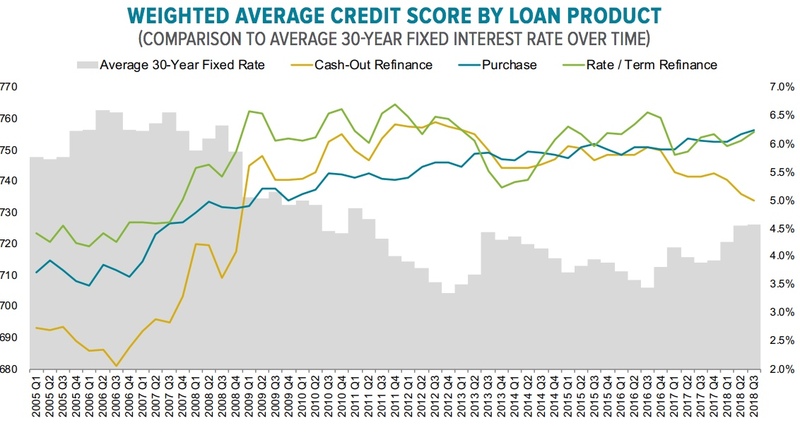 Currently a more widespread decline in cash-out credit scores is being observed which does not appear to be fully driven by rising rates. 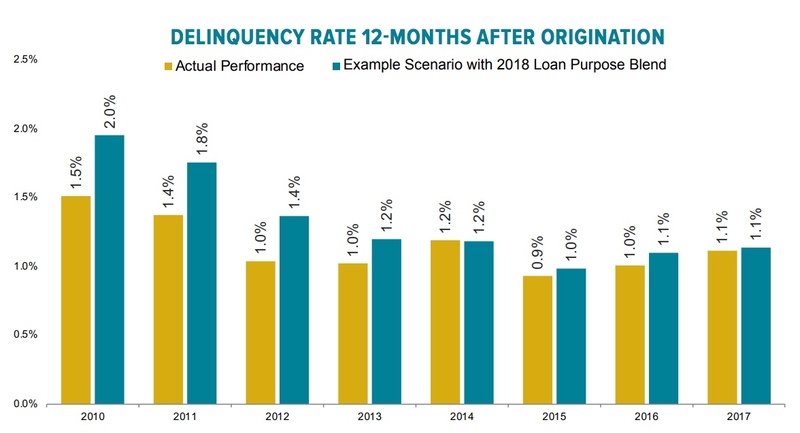 Correspondingly, the 12-month moving average delinquency rate of rate/term refis at six months after origination increased by more than 50 percent over 12 months, actually surpassing that of the market as a whole. A similar, but less pronounced increase was observed among cash-out refis. However, as noted, rising rates usually curtail refinancing, limiting the market impact. Another factor in the origination market is the use of adjustable rate mortgages (ARMs). Although their use usually increases along with rates, their share dipped slightly in the third quarter to 5.2 percent, below the five-year average. Black Knight says a couple of factors probably account for this. First, rising short term and 5/1 arm rates have kept up with and even outpaced rates for 30-year products in recent months, holding the fixed v 5/1 spread steady or even narrowing. 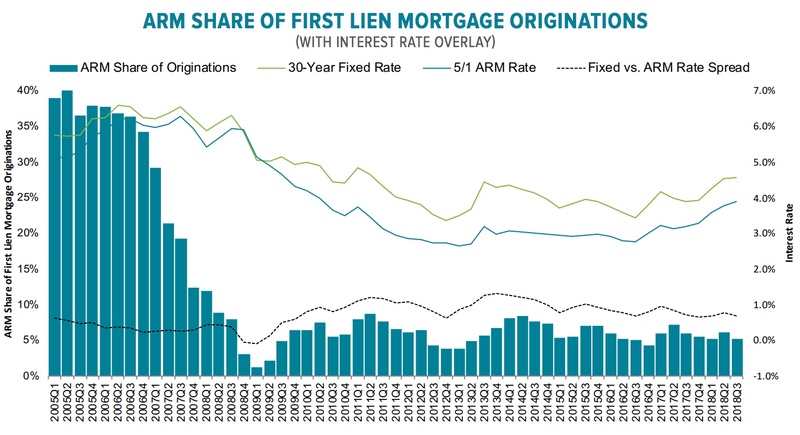 Second, their usually lower introductory rates may not be increasing buying power much because borrowers must be underwritten at the fully indexed rate. While their use is low among conforming loan borrowers, nearly 30 percent of jumbo mortgages are ARMs. The Monitor also notes that the dip in average interest rates on 30-year fixed-rate mortgages has again widened the refinance pool. Rates fell more that 30 basis points to 4.55 percent at the end of December meaning that approximately 550,000 more homeowners had both the incentive to refinance and were likely to qualify. These are borrowers who could reduce their current first mortgage interest rate by at least 0.75 percent. This brings the potential refinance pool back to 2.4 million, a 29 percent increase from what had been a ten-year low. A year ago the pool held about 4.7 million homeowners. 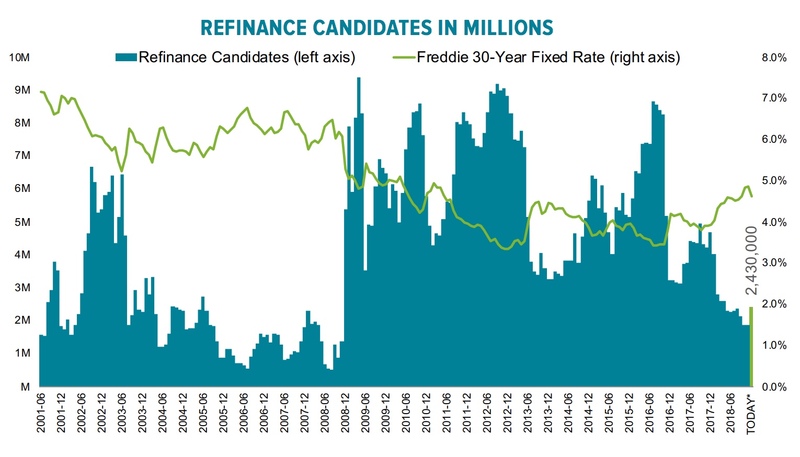 Graboske said the increase in the pool, "may provide some solace to a refinance market still reeling from multiple quarters of historically low - and declining - volumes." Finally, the Monitor notes that home price growth has decelerated by 1.3 percent over the past 8 months, from a four-year high of 6.7 percent in February to 5.4 percent in October. 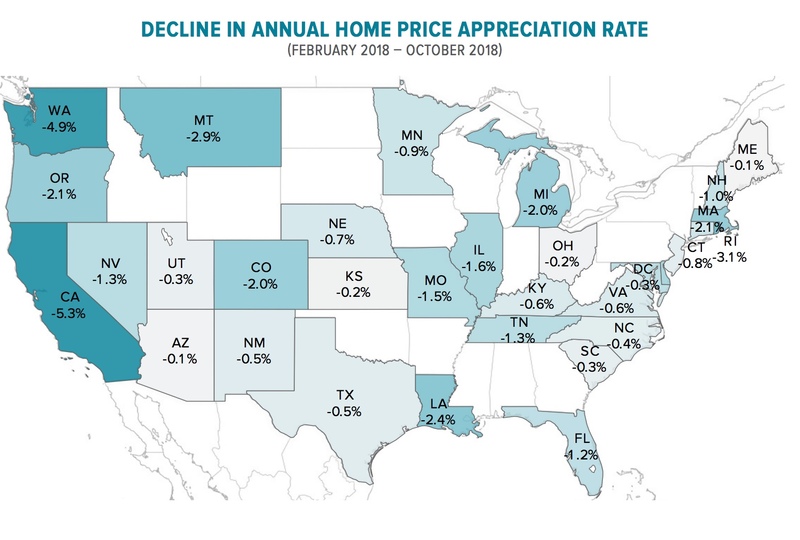 In California the price growth has halved, from 10 to 5 percent over that same period putting price growth behind the national average for the first time since the recovery began. The average home price in the state has dropped nearly $9,000 or 1.6 percent since the June peak, and some especially pricey areas like San Jose have seen even sharper reductions. But California is not alone. Growth has slowed in 33 states and 71 of the 100 largest markets and, while the slowing is especially evident in the West, other states such as Florida have seen substantial changes. There's a lot of info to digest here. I agree that high-score borrowers are often more apt to refinance when rates drop, and less likely to when rates rise. Guess having good money management skills and high scores just go together!